Daniel Radcliffe continues to stretch his capacity in Michael Dowse’s What If (2013), a smart and funny American romantic comedy that puts a modern spin on the age-old topic of whether men and woman can merely be friends. Mourning the loss of his failed relationship, Wallace (Radcliffe) attends a party thrown by his friend Allan (Adam Driver). It’s here that he sparks up an immediate friendship with Chantry (Zoe Kazan), a peculiar animator. Chantry, however, is already in a long-term relationship with Ben (Rafe Spall), a UN economic negotiator. But, determined not to let their connection simply pass them by, Wallace and Chantry agree to be friends – an understanding that proves difficult to maintain. If any of the aforementioned premise sounds familiar, it’s because it is. 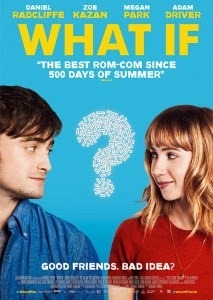 A lot of What If’s histrionics have been plucked from the string of other rom-coms that have proceeded it (the snag of the boyfriend, Chantry’s burgeoning employment situation, to name but two), and there’s no real doubt as to how it will end. The formula may well be the same, but it’s the appeasing contents that raise What If up. Elan Mastai’s script is constantly buoyant as it hurtles through its 98-minute runtime, though a surprisingly good amount of time is kept for one or two observations above love and relationships to be made. There’s charm, too, by the bucket load, made so not only by the naturalistic dialogue contained within the script, but also by the delightful and talented partnership of Kazan and Radcliffe. The chemistry between them shines bright from the minute they set eyes upon one another. Kazan, in particular, who came to audiences attention in Kelly Reichardt western Meek’s Cutoff (2010) and the inventive Ruby Sparks (2012), is spectacular here, admirably turning what could have been a cloyingly self-indulgent character into someone with a well-rounded personality and heart in spades. Radcliffe, meanwhile, is impressive as Wallace, and the supporting cast of Driver, Spall, Mackenzie Davis and Megan Park all have their moments in the spotlight. Dowse’s What If may not live up to the sky high expectations it sets itself early on (it’s certainly far from being the When Harry Met Sally of its time), but its intentions are resoundingly pure. This secures it as a rom-com that’s far superior to the average – one that ties together a talented cast with script that’s by turns perceptive, heartfelt and pleasurable.